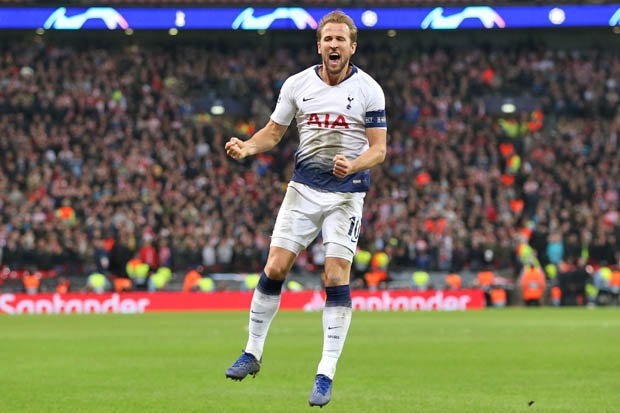 LONDON — Harry Kane kept alive Tottenham’s bid to reach the Champions League knockout stages as the England striker’s late double inspired a dramatic 2-1 win over PSV Eindhoven on Tuesday. Mauricio Pochettino’s side were only 12 minutes away from being eliminated as they struggled to recover from Luuk De Jong’s opener for PSV after 61 seconds at Wembley. But England captain Kane came to the rescue with a predatory equaliser before heading the crucial last-gasp winner with the aid of a deflection off PSV’s Trent Sainsbury. While Tottenham are far from certain to make the last 16, they could at least allow themselves a huge sigh of relief after staving off elimination at the group stage for the second time in three seasons. Describing Tottenham’s campaign so far as "a weird season", Pochettino has sought solace in the political drama House of Cards recently. But life imitated art a little too much for Pochettino’s liking as Tottenham’s defence collapsed like a house in the second minute. There were large swathes of empty seats around Wembley as Tottenham fans showed their frustration at their team’s spluttering European form. The stay-aways appeared to have made the right choice when PSV took their shock lead. De Jong had frustrated Tottenham with a late equaliser in the 2-2 draw between the teams last month and once again the PSV captain improved impossible to contain as he rose above three defenders to head home from Gaston Pereiro’s corner. It was the quickest goal Tottenham had conceded in the Champions League, but the blow sparked them into mounting a sustained period of pressure on the PSV goal. Dele Alli was back in the Tottenham line-up after missing their weekend win at Wolves through injury and the England midfielder almost made an immediate impact. Pouncing on Davinson Sanchez’s knock down, Alli produced a back-heeled effort that was cleared off the line by Angelino. Christian Eriksen and Harry Kane had shots deflected wide as Pochettino’s men monopolised possession. Lucas Moura almost conjured an equaliser with a superb sprint through the heart of the PSV defence. Moura’s initial shot was blocked by goalkeeper Jeroen Zoet before the Brazilian scuffed the rebound over the bar. Zoet frustrated Tottenham again with a brilliant double save, keeping out Eriksen’s close-range shot, then scrambling to his feet to deny Alli from the follow-up before celebrating with a defiant fist-pump. Alli lost another duel with Zoet soon after, this time watching in despair as the Dutch keeper pushed away his low drive. It was the same story after the interval as Tottenham probed for a leveller, only for PSV to soak up the pressure in stoic fashion. As the tension mounted, Pochettino’s decision to take off the lively Moura was greeted with jeers from Tottenham fans. But Tottenham kept pressing in composed style and Kane drilled a fierce strike that Zoet repelled at his near post. Just as time was running out, Kane finally made Tottenham’s territorial dominance pay off in the 78th minute. His physical presence won an aerial duel and when the ball fell to Fernando Llorente, the substitute teed up Kane for a clinical low strike that flashed past Zoet for his 12th goal in 14 Champions League appearances. Donyell Malen almost curtailed the Tottenham celebrations, but his rocket from the edge of the area was pushed away by Paulo Gazzaniga.